being satisfied with Montreal's price. NHL training camps have just started, which this year means that NHL training camps are about to end. And that makes it time to take a final look around the league in anticipation of opening night. Today we'll start with the Eastern Conference before turning to the Western Conference tomorrow. New Jersey Devils - It turns out Ilya Kovalchuk wasn't serious about remaining in Russia after all and is expected back in camp shortly, Lou Lamoriello said while returning from Russia holding a baseball bat and an Ilya Kovalchuk-shaped duffel bag. Washington Capitals - Eric Fehr signed a one-year deal that was completed just in time for the start of training camp, making him the first Fehr in four months to show up on time for something. Winnipeg Jets - Are expected to surprise a lot of people in the Eastern Conference this year, in the sense that whenever they come to town fans will be surprised to remember that for some reason they're still in the Eastern Conference. New York Rangers - The team will be looking to Rick Nash for leadership during this shortened season, since he's used to being in the playoff race for 48 games every year. Carolina Hurricanes - Jordan and Eric Staal will finally get the chance to live out their childhood dream of experiencing the chase for the Stanley Cup together, assuming Marc can get them both tickets. Buffalo Sabres - They've significantly improved their overall toughness in an effort to make sure that no team ever dares take a run at their superstar goaltender, which will come in handy if they ever manage to trade Ryan Miller for one of those. Philadelphia Flyers - Reports that they may be having second thoughts about Ilya Bryzgalov and his $51-million contract are clearly false, since that would require that the signing ever involved any first thoughts. Tampa Bay Lightning - A disappointed Martin St. Louis just realized that's not the sort of super short training camp they meant. New York Islanders - Lubomir Visnovsky has so far insisted on remaining with Slovan Bratislava of the KHL, explaining that he simply prefers to play for a team that has a more realistic chance of making the NHL playoffs. Florida Panthers - Will continue to play their patented defensive style, which involves asking the other team's players "Hey, how exactly did we manage to win a division title last year?" and then skating away with the puck while everyone stands around looking confused. Pittsburgh Penguins - Sidney Crosby will have to adjust to wearing his new league-mandated helmet, which looks mysteriously like Gary Bettman clutching his head like a tarsier monkey while hissing "nobody touch him!" Ottawa Senators - Erik Karlsson enters the season as the reigning Norris Trophy winner, which will give fans a unique chance to see him actually try to defend something. Boston Bruins - The team knows they're going to have to go out there and get their uniforms dirty, at which point Tyler Seguin will try to wash them using his refrigerator, a bottle of shampoo and an old lemon peel. 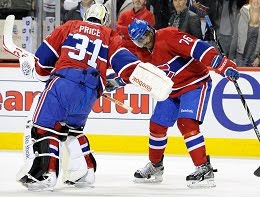 Montreal Canadiens - Have cruelly told Scott Gomez to stay home despite him being the only player in the league to maintain his offensive production throughout the entire lockout. 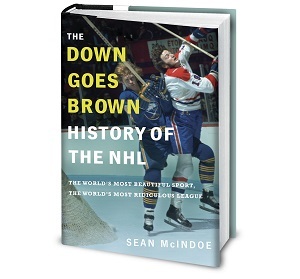 Toronto Maple Leafs - MLSE's ownership group recently fired Brian Burke because they preferred to move forward with a more traditional face of the Maple Leafs franchise: A goaltender drinking from a water bottle in front of a red light while trying not to cry. This must go into the next edition of the Best Of. yes it really should. One of his best yet! Definitely one of the best posts on here. Preds fan here, so you KNOW I was rolling at the Karlsson joke! "assuming Marc can get them both tickets." Post that quote on Carolina's bulletin board this year. LOL! Awesome as always!! Glad to see DGB is ready for the season! I don't get the Tyler Seguin joke! Helps? I must admit, I have called Tyler's mom about my laundry once or twice. This would be funnier it was'nt so true. Still funny, I spit up on my computer. Will Gary Bettman be wearing a shearling coat? The only problem with Bettman clinging to Crosby's head is it would ENCOURAGE players to take headshots at him. Really dont get the Boston one, anyone care to explain please? Rest is definitly best of. boston one and NYR ones are the best! Remember Mike? He just asked how Slovan Bratislava could make the NHL playoffs. I can't stop laughing at the gomez comment. So many good ones, I can't decide which I liked best. Great post! Really? I didn't get it at all. Is it because he's not very tall? He likes short shorts? Seriously, no clue here. Total gold! 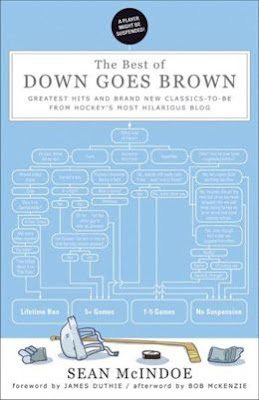 I'm never disappointed with Down Goes Brown but this one is definitely one of my favourites! Start to finish gold. Loved the photo caption! It's an awaiting event for the next conference. It's a great fun if you're watching and some members of the family are cheering for the other team. It's so thrilling to watch this sports together with them. Grantland: What Went Wrong for Brian Burke?